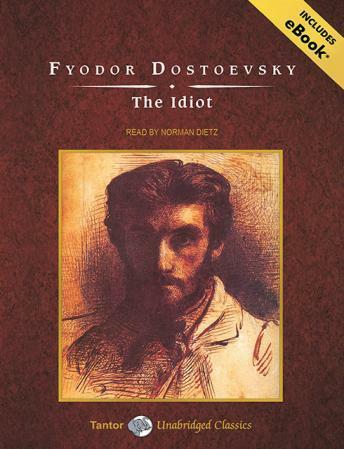 Just two years after completing Crime and Punishment, which explored the mind of a murderer, Fyodor Dostoevsky produced another masterpiece: The Idiot. This time the author portrays a truly beautiful soul and one of Dostoevsky's greatest characters-Prince Muishkin, a saintly, Christ-like, yet deeply human figure. The story begins when Muishkin arrives on Russian soil after a stay in a Swiss sanatorium. Scorned by St. Petersburg society as an idiot for his generosity and innocence, the prince finds himself at the center of a struggle between a rich, kept woman and a beautiful, virtuous girl, who both hope to win his affection. Unfortunately, Muishkin's very goodness seems to bring disaster to everyone he meets. The shocking denouement tragically reveals how, in a world obsessed with money, power, and sexual conquest, a sanatorium is the only place for a saint. This version of The Idiot is the translation by Eva Martin.